British Jews are rooting for a Conservative Party victory in the forthcoming general election, with an overwhelming majority of the demographic saying they will give Prime Minister David Cameron their vote, a new poll says. The survey, conducted among readers of the Jewish Chronicle, involved a sample of over 500 British Jews. It found 68.9 percent of participants intend to vote Conservative, while 22 percent will hand Labour Party leader Ed Miliband their backing. The study found 60.5 percent of respondents thought the Tories offered the best policies on Israel and the Middle East, while only 7.7 percent thought the same for Labour. It also reveals 64 percent of participants believe Cameron has the “best attitude towards British Jewry,” while only 13 percent saw Miliband as the best community supporter. Poll :British Jews will vote Conservative British Jews are far ahead of the American co-religionists in rejecting the left’s siren calls. Furthermore, 73 percent said the parties’ attitudes to Israel were “very” important in influencing how they would vote. Labour leader Miliband received staunch criticism over the perceived “toxic anti-Israeli” stance he assumed during last summer’s Gaza war. Jewish Chronicle political correspondent Marcus Dysch blamed “toxic” Miliband for Labour’s loss of support among British Jews. One of the “most obvious” reasons he lost support is due to him “positioning himself as Israel’s chief political critic” during the Gaza conflict, he said. “One has to wonder, having observed Cameron’s love-bombing of British Jewry for the past two years, did Labour not bother at any point to respond in its own way?” he added. “British Jews see both the party and its leader as toxic” on issues concerning the Middle East and Jewish community. Miliband is the descendant of Jewish refugees who fled the Holocaust. The Labour leader recently paid tribute to his grandfather who died in the Nazi death camps. He told the New Statesman his “Jewishness and Britishness” are intertwined because of his family history. “I have many friends active in both Labour and Conservative circles with healthy debates in both,” he said. Large majority of British Jews voting Tory. Labour must reaffirm its commitment to Israel and to the eradication of antisemitism. “Labour must reaffirm its commitment to Israel and to the eradication of anti-Semitism,” he said. “The Jewish population in the UK is quite concentrated on a number of geographic areas so within those areas they might well form a not insignificant part of the electorate,” he said. 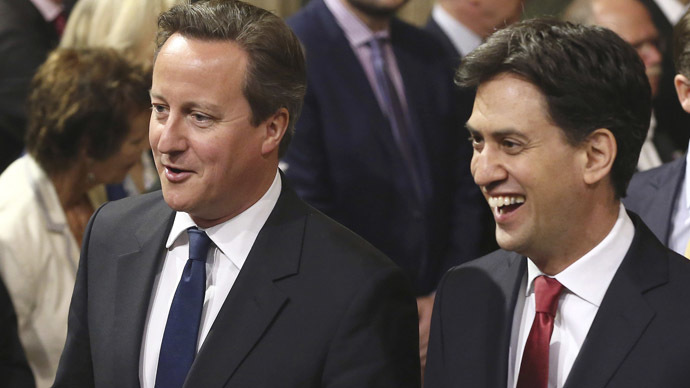 Elsewhere, a poll from Populus put Labour 2 percentage points ahead of the Tories (33 percent vs 31 percent). The survey was published after former PM Tony Blair advised voters that a referendum on EU membership could diminish the UK.